Compact and versatile design of MeteoWind 2 meetings strict requirements of Wind Resource Assessment studies and features the benefits of Elliptical cups with their inherent advantages compared to conical and round cups of exisitng anemometer designs. Please see FAQ for IEC 61400-12-1 Wind Resource Assessment. Meet MEASNET requirements and increase data quality with this compact anemometer design. Meet MEASNET requirements and data quality in winter with this compact heated anemometer. Compact anemometer with a wind vane for meteorological use with digital and analog wind speed and wind direction output. Combined anemometer and wind vane for weather stations and industrial SCADA systems. The positive aerodynamic properties of elliptic cups enabled us to make MeteoWind 2, the most compact anemometer to meet the strict MEASNET linearity requirements. Patented elliptical design offers a larger wind blown area than circular and conical cups for higher aerodynamic torque to overcome bearing friction for consistent response in all temperature conditions. Aerodynamic stability in all-weather and throughout the complete wind speed range is a result of the elliptical cup cross section. Elliptical cup cross section is a very stable aerodynamic shape whose flatness limits snow accumulation in winter. MEASNET calibrations available per request. Click here for a sample MEASNET anemometer calibration result. Calibrations up to 38 m/s are available per request at customer specified wind speed calibration points. Click here for a sample full scale ISO anemometer calibration result. Clarifications for the use of MeteoWind 2-in-1 Wind Speed & Direction Sensor with MEASNET Calibration in wind resource assessment when replacing existing Class 1 anemometers and wind vanes. Our requirement is 120 units of anemometers and 60 units of wind vanes. 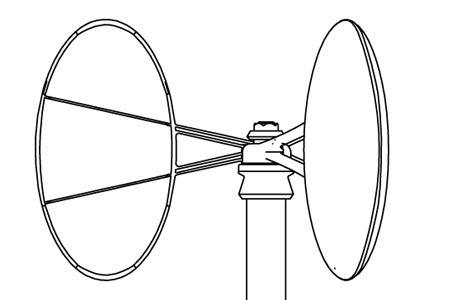 IEC 61400-12-1 specifies clearly that no other instrument shall be positioned closer than 1.5 meters vertically from the anemometer cups and the wind vane shall be mounted at a minimum of 1,5 m below the primary anemometer. Moreover we install anemometers and wind vanes at different heights. Does MeteoWind 2-in-1 wind speed & direction sensor satisfy this requirement as they will measure at almost same height. This IEC 61400-12-1 requirement was written before the MeteoWind 2 wind sensors were developed. Further, MeteoWind is a single wind sensor measuring wind speed and direction and not two separate instruments as IEC 61400-12-1 assumes. How does MeteoWind's configuration compare to the IEC 61400-12-1 requirement that no other instrument shall be positioned closer than 1.5 meters vertically from the anemometer cups.. Will it affect wind speed or wind direction data quality? In MeteoWind 2 configuration, wind shadow between wind vane and anemometer does not exist, therefore measurement is more accurate. Current IEC 61400-12-1 requirements place the wind vane approximately 1.5 meters away from the anemometer which in separate anemometer and wind vane installations is logical due to wind shadow effects. Since MeteoWind wind vane is not a separate instrument, an exception applies. Sensor wind shadow effects are eliminated in MeteoWind wind sensor installations. Meteowind wind vane does not affect the wind speed due to its position, size and geometry. The use of 3-stage lightning protection is complemented by the RS-485 digital output which has inherently high resistance to interference and is therefore the most widely used communication interface in tough industrial environments. Together, they are able to ground out any unwanted electrical interference from wired connections. Can the MeteoWind wind sensors be mounted on existing Towers? MeteoWind can be mounted on any towers. If a special mount is required, Barani Design can develop and manufacture a mount for quantities >=100pcs. Usually unit pricing for mounts can be around 20eur, depending on geometry. Kindly confirm if Cloud Based Monitoring software can be supplied for wind monitoring with MeteoWind? If not, where will the data from the modem of the data logger be sent to, as the supplier has to ensure the compatibility of data logger to our server for remote monitoring. Data from EasyLogGSM or ProLogGSM data loggers can be collected on the allMETEO.com servers and exported at any time or retrieved via a secure API to the customer's software. Usernames and passwords for allMETEO.com accounts will be provided to all customers. Installation work is in our scope, but the selected bidder needs to provide demonstration of all the equipment /sensors to our team. Evaluations of MeteoWind anemometers can be provided free of charge as long as BARANI DESIGN receives documentation and complete reports of the evaluation including installation pictures. After the evaluation period expires, if a first order is placed, the customer may keep the evaluation hardware free of charge or if an order is not placed, purchase the hardware at a 50% discount if the hardware is not returned at the end of the evaluation period.